Masters: Glass Beads: Major Works by Leading Artists, 1000 Glass Beads, Contemporary Lampingworking , Bronwen Heilman: Vitreous Painting Techniques for Glass Beadmaking, Bead and Button Magazine, Beadwork Magazine, Lapidary Journal, Glass Craftsman Magazine, etc…, By 1998, she was making glass beads full time. She was one of the first to receive the ‘Presidents Award’ from ISGB where one of her pieces is now at the Corning Glass Museum’s permanent collection, 2007. She has also won first place in the soft glass marble category in the Tucson Flame Off in 2009, and Best of Jewelry award at the Sedona Art Fair, 2010.She has taught and demonstrated since 1999 at many locations throughout the U.S. as well as worldwide including: International Lampworking Festival in Kobe, Japan and Hamburg, Germany and twice at the International Bead Societies yearly gathering (2000, 2010). Since 2000, she has concentrated her efforts on the reverse painting technique that she has created for soda-lime glass beads. And also, since 2007 she is experimenting on using bottle glass in new and unique forms. 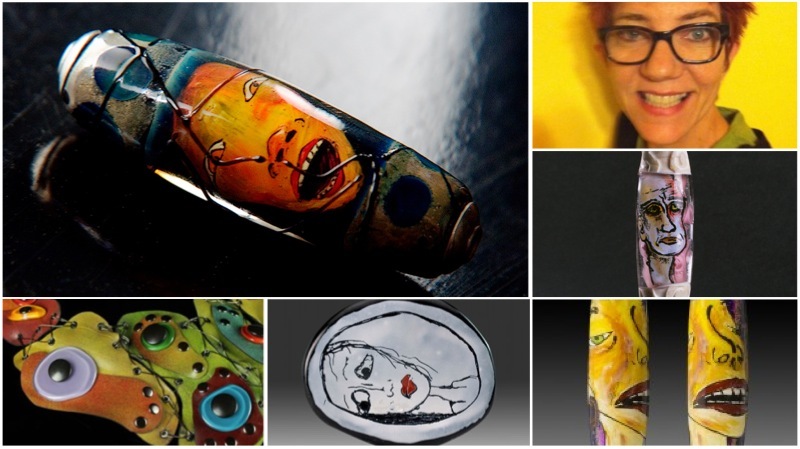 This is an intermediate class focusing on how to work with enamels and how to apply them. We will be applying wet enamel, capturing your own line-drawings on a flat surface then, after firing the enamels; we will apply the image to a bead. Day 1: We will be creating our own one-of-a-kind small glass paintings. We will learn how different brushes create different effects, and how to sign you name on your work. Day 2: We will be lighting the torch and rolling up our sleeves, as well as our paintings, to create beautiful pieces of wearable art. There will be a lot of hands on practice in order become comfortable with the amount of heat we need, and the new tools we will be using to make the images permanent on our bead.